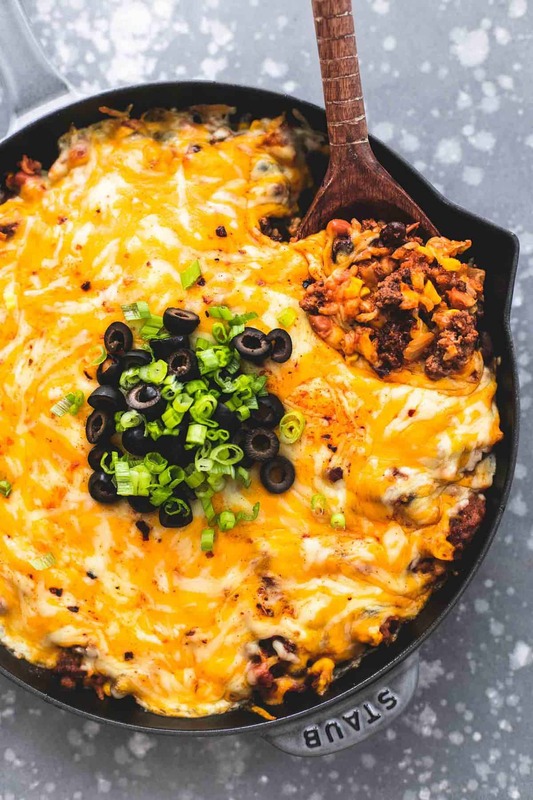 Incredibly cheesy Mexican Beef and Rice Skillet made with ground beef and ready in just 30 minutes. So quick, easy, and delicious the whole family will be begging for seconds! One-pot dishes are a lifesaver! With the twins and the new little bambino, the less I have to fuss with (and clean up!) dish-wise, the better! Whether dinner is made up all at once in a sheet pan, a slow cooker, an Instant Pot, or heck, even a huge sandwich one one plate, I’m so there. This Mexican Beef and Rice Skillet came to me when I was thinking about other one-pot meals I’d made in the past. I love how rice and noodles can cook up perfectly with the other ingredients if there are other liquids for it to soak up. Also, I love Mexican food — so why not combine them? In this recipe, even though you might doubt it, there IS enough liquid from the salsa, the cooked beef, and the other ingredients for the rice to cook to perfectly soft perfection — no hard crunchy bits here. For the skillet, I chose a cast-iron one because I love the sturdiness of it and the way you barely have to scrub those, either. However, any oven-safe skillet will do. If you don’t have one (and metal pots with rubber handles are NOT oven-safe — believe me, I’ve been there and those handles will melt right off) you can cook the meat and add the other ingredients, cook a bit more, and then transfer everything into a casserole dish to finish in the oven. What Does It Mean to Brown Meat? I realize some of you that read my blog might be novice cooks. If that’s you, welcome! Everyone had to start somewhere and I’m glad you chose my blog as your starting place. Some common terms and cooking phrases that I use may not be so common to everyone, like browning meat. What does that mean exactly? Well, there’s really no secret, hidden meaning other than to turn the pink meat brown by cooking it. When a recipe calls for “browned meat” or to “cook until browned” that means that you want to cook it until there is no more pink visible. That means it has cooked through enough to not make you sick when you eat it and cooked enough to move on to the other parts of the recipe, like adding other ingredients, mixing with pasta, putting on tacos, etc. What Are Some Substitutions for Beef? I created this recipe around beef because it’s what’s most commonly used in tacos and Mexican dishes calling for ground meat. I also happen to be a fan of beef so it kinda is my go-to for recipe creation when I think of anything related to tacos or taco-like recipes. However, there is ALWAYS room for substituting one ingredient for another in cooking. Not so much in baking, where measurements have to be more precise, but cooking is more easy-breezy. If you don’t eat beef, try adding ground turkey or chicken instead. Both will work just as well in the recipe and will taste just fine, although they are a little leaner as far as fat content goes, so you might need to add just a leeeetle bit of water before adding the rice and putting it into the oven. I do think that this recipe needs a ground meat though. 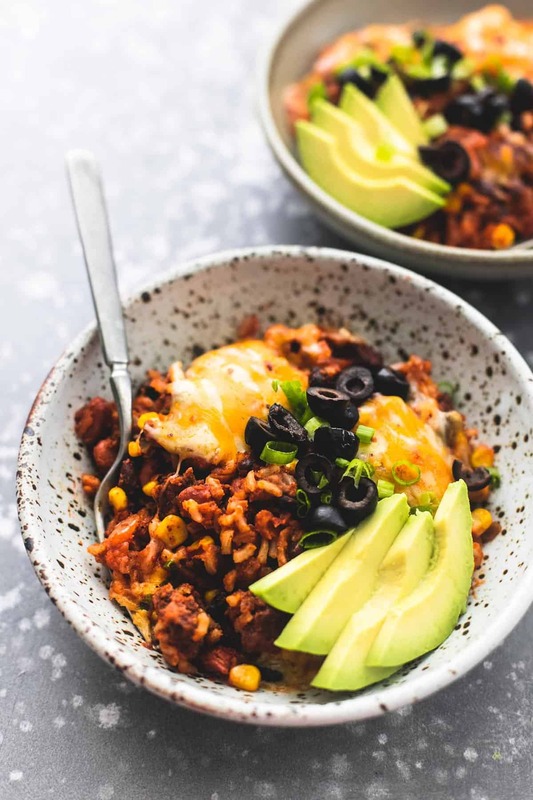 If that’s not your jam, then try this One Pot Enchilada Orzo recipe — it’s vegetarian and has a lot of the same flavors and textures and is just as time-saving as this one. 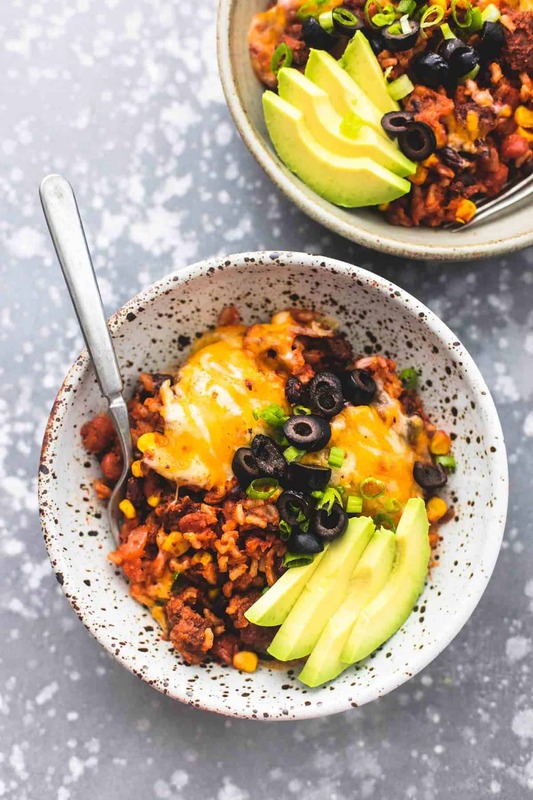 What Other Toppings Work Well With Mexican Food? I suggested you top the Mexican Beef and Rice Skillet with avocado, diced tomatoes, chopped green onions, and sliced olives. These are all completely optional. Maybe you don’t have the time or inclination to chop up anything else for this recipe and that is totally fine. If you don’t like one of the toppings, feel free to skip it, too. Other toppings that would work well though include slices of jalapeno (fresh or jarred, but keep in mind the fresh ones can be much hotter), shredded lettuce, pickled onions, hot sauce, red pepper flakes, guacamole, or red onions. Preheat oven to 375 degrees. In a large oven-safe skillet (see note) over medium heat saute ground beef until browned. Stir in rice, salsa, seasonings, beans, and corn and cook 2-3 minutes longer. Sprinkle cheese over the top and transfer the skillet to the oven. Bake for 10-15 minutes until cheese is completely melted. Top with any desired toppings and serve. 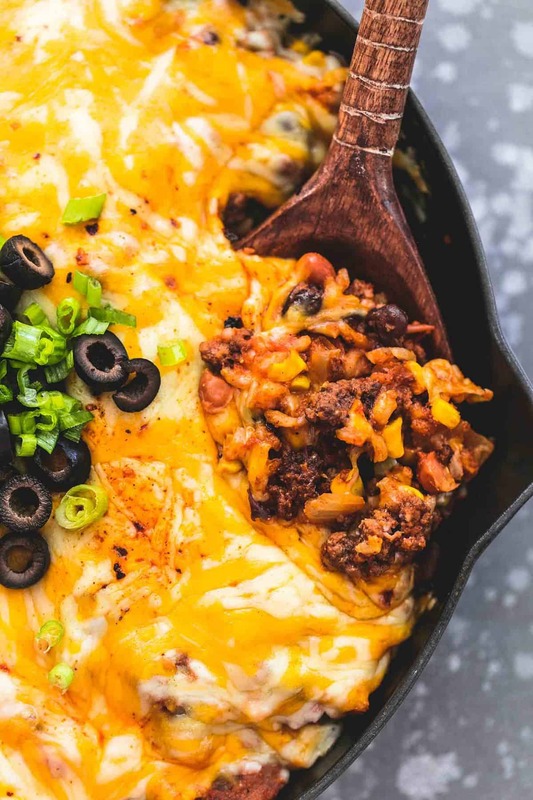 If you don’t have an oven-safe skillet you can complete step one with a regular skillet and then transfer into a casserole dish for step two. Alternate serving option: use as a filling for burritos!